But before we all head home for winter break, there's some important things to do here at cuse. This includes tailgates…LOTS AND LOTS OF TAILGATES. When it's not too chilly outside, you can catch us either at East Adams, 507 Comstock, The Pickle, The Shack, or even Castle Court if it's a big win (duck fuke), but because we are in fact in Cuseland, aka one of the coldest and snowiest places in the country, it's sometimes a little rough tailgating outside in ripped jeans and a bomber jacket. So in retrospect to that, you either bundle up or bring the party inside. While this is a serious bummer, the weather doesn’t stop Syracuse from doing what they do best: Getting psyched and partying. On game day, tents on tents line any and every parking lot near campus where they can be seen filled with dedicated fans drinking and barbecuing in the name of otto. As for the Syracuse students, they could be seen at a variety of places: House parties, rallying in dorm rooms, hitting the outdoor lots, or tearing it up at the frats. In particular, the frats are nothing shy of giving Syracuse its well-earned party school title. Wild day drinks are filled with shotgunning, elevated surfaces, and some serious bangers that have you dancing till your feet hurt. All in all, it's a hell of a lot of fun, where #rallying is a must. In terms of tailgate attire, as per usual, we go all out. Students display a variety of styles and never fail to prove to the world just how good it looks to be orange. 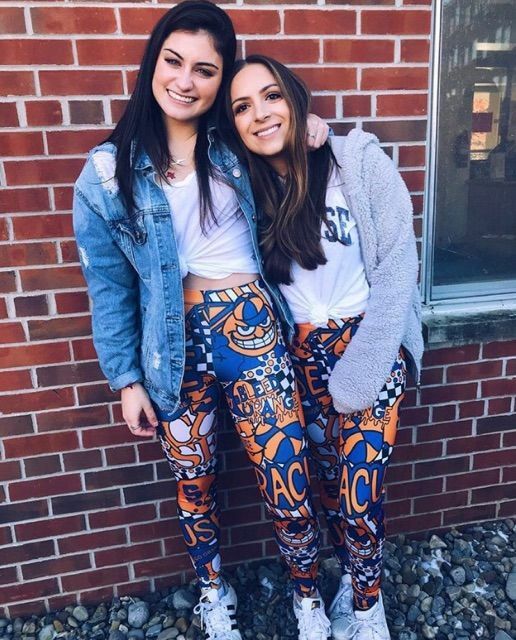 Decked out syracuse leggings. Always good with sneakers, particularly ones that you're not afraid to get dirty. Game day skirts and snipped sweaters= Power move. If it gets cold, maybe a hat or scarf. Add a bandana to spice up any outfit. OH and glasses. Don't forget the glasses. Cold and snow calls for fur coats…any and every color. Stay trendy and continue spreading the game day love ! !